As the next stage of this exciting project along the Intracoastal Waterway moves forward, future residents of Trinity Landing have begun to select and reserve their residences! With many open, airy, luxurious floor plans to choose from, depositors can now select their favorite future home. Floor plans range in size, style and layout, so there’s something for everyone. From apartment homes to villas, the perfect residence for your active senior lifestyle awaits you at the soon-to-be-built community, Trinity Landing. Trinity Landing is the latest resort-style Continuing Care Retirement Community (CCRC) coming to the Wilmington area. Set to open in 2021, it will serve up scenic views, active living and a maintenance-free lifestyle. No matter the residence you choose, you’ll be part of a welcoming community in an ideal location. 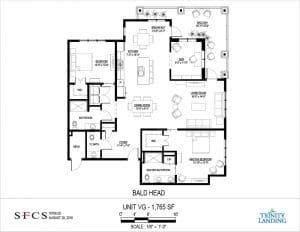 If you’re looking for a larger residence, take a look at the Bald Head floor plan—a modern, 1,765 square foot villa with two bedrooms, two and a half baths, a den and an enormous, wraparound balcony. With its open design and large number of windows, every room has an airy feel. The Bald Head features upscale features like walk-in closets, modern bathrooms and kitchen finishes, and plenty of storage space. The Bald Head is especially suitable for people who like to host friends and family. The open floor plan is great for gatherings, and the extra bedroom and bathroom allow overnight visitors to stay comfortable. If it’s privacy and tranquility you’re looking for, the Bald Head’s master suite and separate den provide plenty of options for peaceful relaxation. Whether you want to read a book, get some work done or spend time on your hobbies, you will have a dedicated space for your enjoyment. If you prefer the outdoors, this floor plan’s shining gem is the large, wraparound balcony. It offers plenty of room for a table and chairs—or planters—creating an inviting outdoor area for morning coffee, a quick lunch or even dinner with friends. Imagine taking in beautiful views of the Carolina coast from the balcony and breathing the refreshing salt air throughout the majority of the year. As you enter through the front door of the Bald Head villa, you’ll be greeted by the cozy foyer, which has a coat closet and a half bathroom off to the side. You can use the closet to neatly store your jackets and shoes, and the half bathroom provides a convenient spot to freshen up before you head out to see friends in the community. Take a few steps forward through the foyer, and you’ll enter the airy, open floor plan containing the kitchen, living room and dining room. When hosting guests, you’ll never miss a moment, whether you’re in the kitchen preparing food, enjoying a meal at the table or relaxing in the living room. To the back of the floor plan is the den, which you can designate as an office or library, or perhaps a hobby room. Just beyond the den to the outside of the residence is the balcony, with entrances from both the living area and the dining area. In front of the main living area is the entrance to the comfortable, private master suite, including a walk-in closet and bathroom. The bedroom is large enough for all your furniture and creature comforts, and the full bathroom features double sinks and a linen closet. Adjacent to the living space is the guest bedroom, which has its own walk-in closet. The hallway to the guest room includes the entrance to a separate, full bathroom and the nearby washer and dryer, which are hidden behind closed doors for aesthetics and convenience. Best of all, each of the home styles at Trinity Landing will be part of a welcoming community with thoughtful services, exceptional amenities and gorgeous, coastal Carolina surroundings. A lifestyle without home maintenance will free your time and fully relieve you of many of the aggravations associated with home ownership. With more time to enjoy how you wish, you’ll be inspired and enabled to revel in the active senior lifestyle that Trinity Landing will provide. For more information about Trinity Landing, give us a call at 910-769-9600, or visit us online to get your free information kit. Don’t wait to reach out—residences are being reserved quickly!